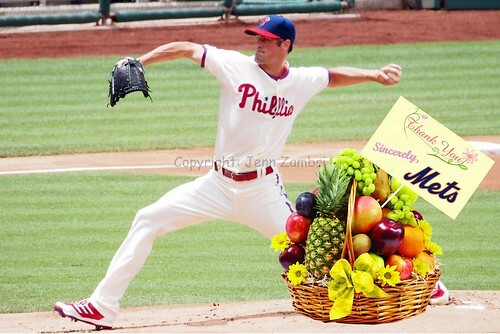 Cole Hamels is a true humanitarian. He has adopted a child from Africa and created a foundation to fund programs both there and in Philadelphia. And now, apparently, he has also adopted the New York Mets. Hamels gifted the Mets with 6 runs and a win in Tuesday night’s game that ended in a 1-6 loss for the Phillies. He especially loves Mets pitcher Jonathan Niese, whom he walked in the 4th inning with the bases loaded to score another Mets run. You know how pitchers just have that little extra warm feeling for other pitchers? Well Cole was man enough to wear his heart on his sleeve. Touching, really. Many Mets were beneficiaries of Hamels’ generosity. Daniel Murphy, Ruben Tejada and Chris Young all raised their batting averages by at least 20 points! It was like Christmas for the Mets. They probably sent him a very nice fruit basket after the game. Joking aside, in only his second start this season, Hamels crashed and burned. It was ugly. Afterwards, Hamels told the press he was “embarrassed” by his performance. I guess we can give him brownie points for that. 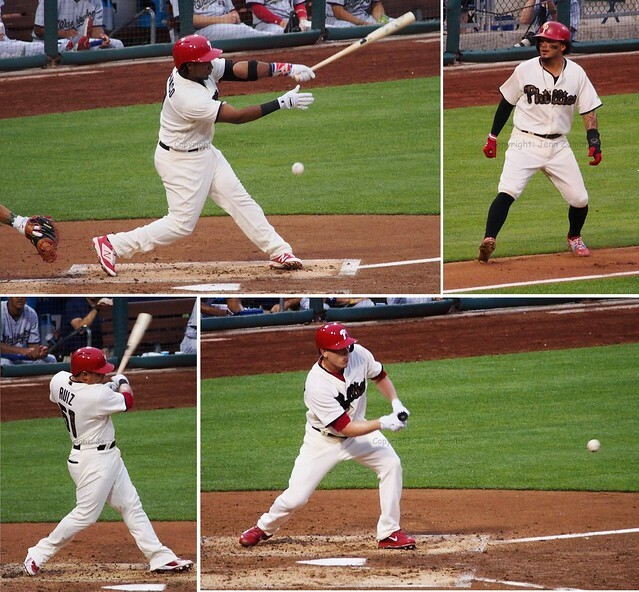 The only offense for the Phillies was a Marlon Byrd home run. Ryan Howard had 2 hits as well but was left stranded on base both times. The Phillies are supposed to play the Mets again tonight, but with the forecast looking grim, it is hard to say if that will actually happen. Tuesday’s game was delayed by an hour and a half and that rain was much lighter than predicted for tonight. If they do play, Kyle Kendrick is scheduled to pitch. When one of your ace pitchers gives up 3 runs in the first inning, you know it is going to be a bad day. 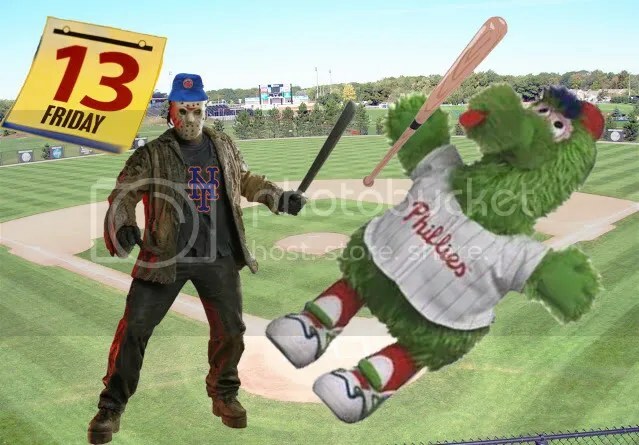 Add to that having the Mets in town, the 3rd anniversary of Harry Kalas’ death and the fact that it is Friday the 13th and things look pretty grimm. Not that Cliff Lee pitched too badly. He made a few mistakes and the Mets lowered the ax. Making matters worse, the Phillies knuckleballing nemesis R.A. Dickey was pitching for the Mets. Although, the Phillies did collect 11 hits; they just failed to score. The one happy moment in the game came when rookie Freddy Galvis smashed his first major league home run. Grinning in the dugout afterwards as the team gave him the silent treatment, Freddy did not have to wait too long for some congratulations. Jim Thome strained to keep a straight face and was eventually the first to give Galvis a bear hug. But after that, the nightmare continued for the Phillies. On his 29th birthday, Hunter Pence received the gift of going 0-for-4. And although Jimmy Rollins had 3 hits, he made a huge defensive blunder in the 9th inning, bobbling an easy double-play ball. Rollins did not recover and both runners were safe. That mistake led to another run for the Mets. The Mets had their share of goofs as well. Daniel Murphy collected a fielding error and catcher Josh Thole did something I have never seen before. In the 2nd inning after hitting a single, Thole ran to 2nd on a Dickey sacrifice bunt. Then unexpectedly, Thole, who was safe at 2nd, began trotting back to 1st base as if the bunt never happened! Before Thole realized his stupidity, the Phillies tagged him out on his way back to 1st. 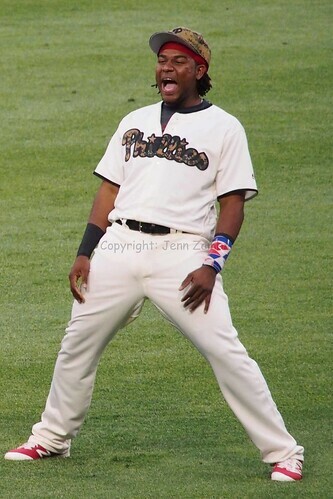 This will be a classic for the MLB blooper reel. Maybe Thole was trying to make the record books with an unprecedented “reverse steal?” Whatever the reason, he does win the award for dumbest baseball play ever. But even that bit of entertainment cannot soften the blow of a sad 5-2 loss to the lowly Mets. Oh well, tomorrow is another day. Better than that, tomorrow is NOT Friday the 13th. 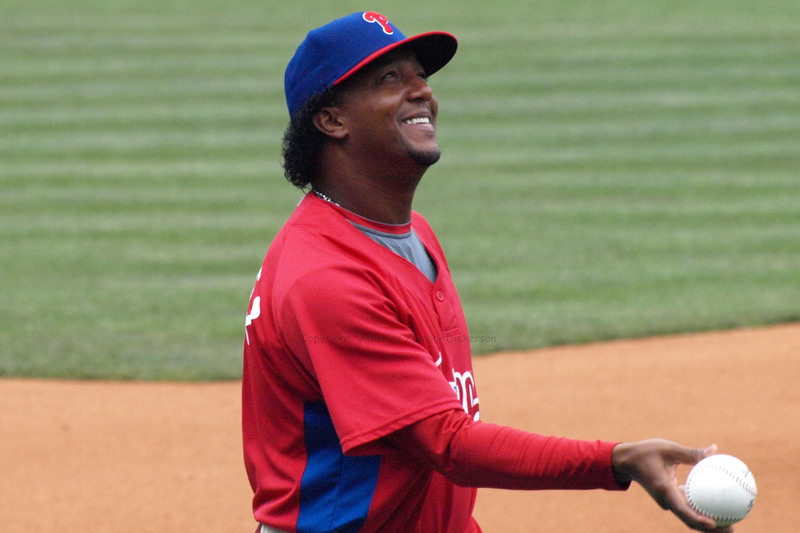 Going back to New York for the first time since leaving the Mets, Pedro Martinez had an eventful day on the mound. However, his start on the mound was actually preceded by his first turn at the plate. The Phillies absolutely destroyed Mets starter Oliver Perez taking him deep twice in the 1st; both Jayson Werth’s and Carlos Ruiz’s homers scored 3 runs each. Down 6-0 with 2 outs, Perez had to face his old teammate and Martinez stood at the plate while Perez tossed three straight balls to him. With that 3-0 count, the Mets manager sprung from the dugout and took Perez out of the game mid-batter. To sum up the inning for Perez: total humiliation. But the bottom of the 1st inning was no less eventful. The first batter of the game for the Mets hit what looked like a ground rule double to centerfield. As the ball jammed itself under the outfield padding, Shane Victorino threw his arms up in the air to tell the umpires that the ball was unplayable. Raul Ibanez saw that the umpires did not react and quickly snagged the ball and threw home, but the throw arrived too late and Angel Pagan wound up with an inside-the-park home run. Apparently, Victorino was unaware of the ground rules in the new Citi Field and balls stuck under the padding are still considered playable. Both sides must have felt like they were entering the Twilight Zone after the weird start to the game. Martinez looked uncomfortable on the mound and was missing his spots badly. He allowed 4 runs in the first 3 innings but just when it looked like it was going to be a very bad day for him, Martinez settled in and pitched lights out for the next 3 innings. He was so good the last two innings, it looked like he might go out for the 7th, but Charlie Manuel decided to go to the bullpen. 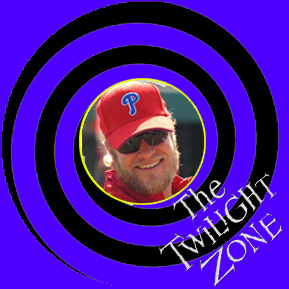 The Phillies are probably trying to continue to ease Martinez into longer outings little by little and did not want to risk an injury. The Phillies scored a few more runs in the game and even Martinez helped himself to a hit and an RBI in the game. Victorino took a career high 3 walks in the game and Eric Bruntlett had 3 hits in a rare start at second base. But the insanity continued into the 9th inning and most of it had to do with Bruntlett. Bruntlett hit a line drive to right field in the 9th and it was just barely caught by the outfielder; the umpire ruled he trapped the ball and it looked like Eric had a triple. But the Mets argued and the officials overturned the call; a call that, by the way, was NOT reviewable. Replays showed he did make the catch but he did not show the transfer from glove to hand to the umpire. Then in the bottom of the ninth Brad Lidge took the mound and all hell broke loose. Ryan Howard missed a ball that rolled past him and gave the Mets a triple when it should have been the first out. The next batter hit the ball to Bruntlett who bobbled it for error #2; the run scored and still no outs. Daniel Murphy hit a single to make it 1st and 2nd, still no outs. And then the unbelievable happened; Jeff Francour, the same Met who caught the Bruntlett liner in the top of the 9th, hit a line drive to guess who? Eric Bruntlett. The runners were off on the pitch so Bruntlett caught the ball for one out, stepped on second for the next out and then tagged Murphy to complete the unassisted triple play! The unassisted triple play to END the game no less. OMG! The announcers said that this was the first time ever that an unassisted triple play ended a game; but it is actually the 2nd time. Johnny Neun did it on 5/31/27 for the Tigers. But in all of baseball history, it was only the 15th time the unassisted triple play has ever happened. Two of those have now been completed by Phillies; Mickey Morandini did it on 9/20/92 for the Phils. You just saw history people; more rare than the no-hitter or even the perfect game; the unassisted triple play – AMAZING.